Artist Yuri Schwebler turns the Washington Monument into a sundial in the snow, c. 1974. Thanks to Natalie Campbell and Kristina Bilonick for the tip! 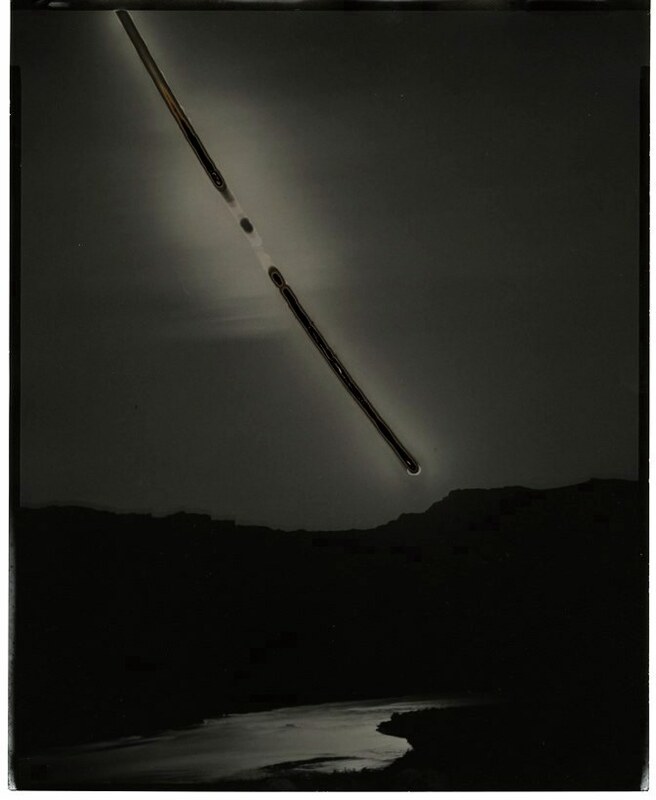 Photographer Chris McCaw tracks the movement of the sun across the sky with exposures ranging from about 2 to 8 hours in length with his home-built large-format cameras which use black and white print paper. The long, direct-sunlight exposures create positives–solarized images. And because the sun is so highly focused, the paper burns, leaving gashes and streaks across the images. See more on Chris McCaw’s website. Thanks to Casey Brandt for bringing to my attention! Chris McCaw, Sunburned GSP#400(Pacific Ocean), 2009. 4-8″x10″ unique gelatin silver paper negatives. The Corpus Clock was invented and designed by Dr John Taylor who brought together in its creation an exception team of craftsmen, engineers and skilled technicians. The clock’s face is a rippling gold disc, about 5 feet diameter, and displays the time by opening individual slits in the clock face backlit with blue LEDs instead of hands. The dominating feature of the clock is a sculpture of a devouring metal insect which looks like a grasshopper or locust. The sculpture is actually the clock’s escapement. 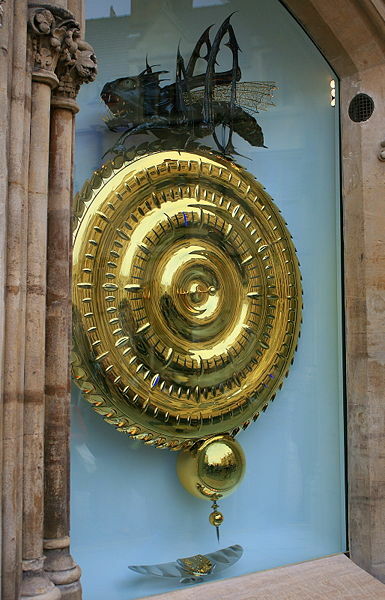 Taylor calls this beast the Chronophage (literally “time eater”, from the Greek). It moves its mouth, appearing to “eat up” the seconds as they pass, and occasionally it “blinks”. The creature’s constant motion produces an eerie grinding sound that suits its task. The hour is tolled by the sound of a chain clanking into a small wooden coffin hidden in the back of the clock. Below the clock is an inscriptionÂ mundus transit et concupiscentia eius (“the world passeth away, and the lust thereof”). Conceived as a work of public art, the Chronophage reminds viewers in a dramatic way of the inevitable passing of time. Taylor deliberately designed it to be “terrifying”: “Basically I view time as not on your side. He’ll eat up every minute of your life, and as soon as one has gone he’s salivating for the next.” Others have described it as “hypnotically beautiful and deeply disturbing”. More info: YouTube video explaining clock, chronophage website, and conspiracy theorists. 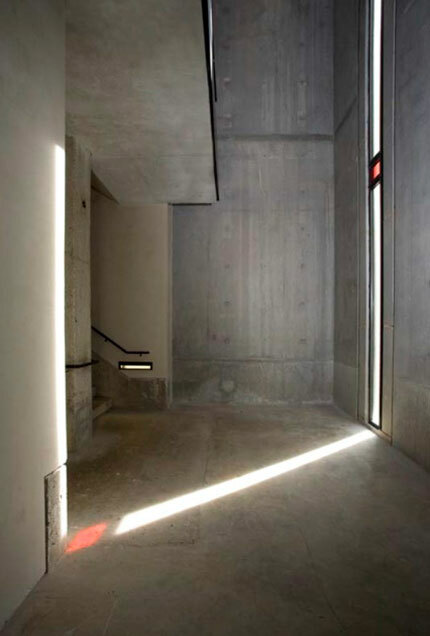 A new addition to the UVA school of architecture: a slot window in a stairwell that is shaped to catch the sun as it passes through the seasons. Â The angles of the window are tuned to the solstices. Thanks “William” Russell for the photo. “The author points out that in ‘environmental art’ (also called ‘public art’) artists must take into account not only their individual artistic desires but also the reactions of the general public. 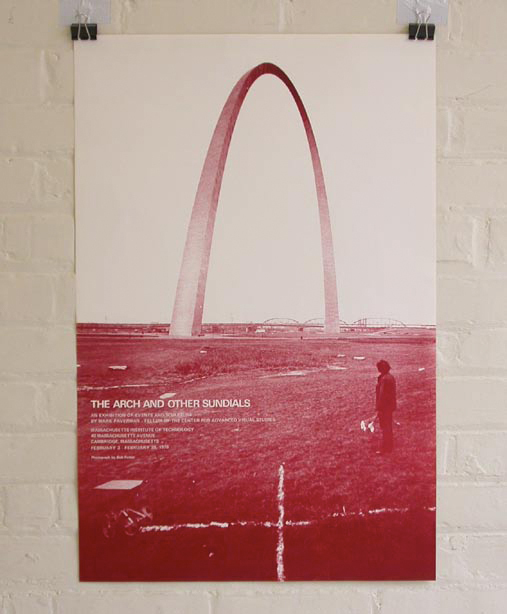 He finds that he has accomplished this by means of his large-scale events that are based on the theme of the sundial. 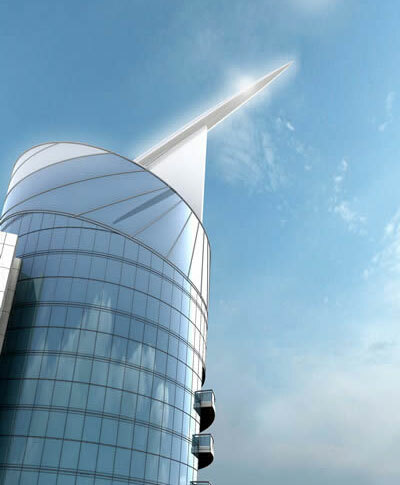 He hopes that the public, attraced by the funcitional character of the sundial, will obtain aethetic satisfaction from the artistic aspects of the events and also see the surrounding environments in a new way. The former curator of Harvard University’s Collection of Historical Scientific Instruments, William Andrewes, hasÂ become a “dialist,” or maker of sundials. His idea is to base the dial on an unusual type of map, and to center the map on the very spot where the dial will stand. The map’s meridians of longitude serve as the sundial’s hour lines, creating a union of time and space for that particular locationâ€”something no dialist or clockmaker had ever before achieved. An inspiration for Andrewes’ Longitude Dial was a 1610 map by Nuremberg mathematician Franz Ritter (below, thanks Smithsonian website). 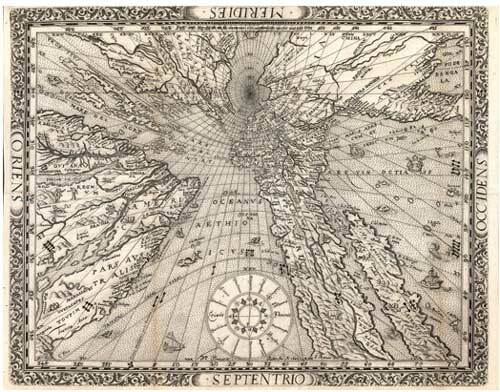 It placed his city at the center, so that the meridians of longitude emanating from the North Pole could also serve as the hour lines of a Nuremberg sundial. 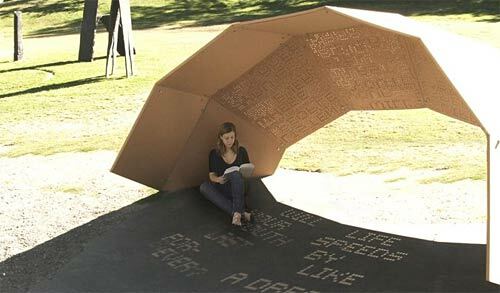 Using a complex array of perforations, the One Day Poem Pavilion‘s surface allows light to pass through creating shifting patterns, whichâ€“during specific times of the yearâ€“transform into the legible text of a poem. The specific arrangements of the perforations reveal different shadow-poems according to the solar calendar. 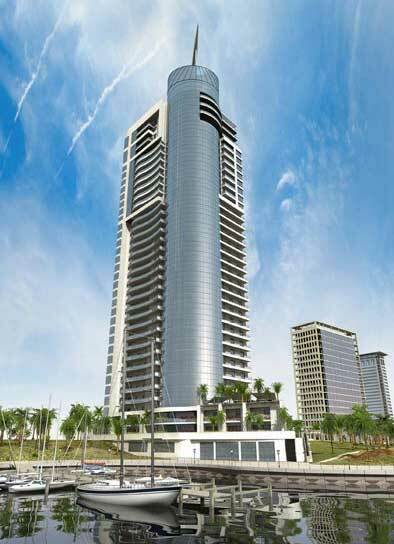 Timeplace incorporates a huge sundial on top of the skyscraper so that the sundial’s shadow falls across the building’s cylindrical shape, allowing the time to be seen from miles away and from everywhere within the Marina. 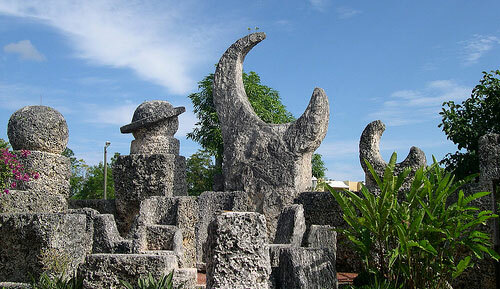 Edward Leedskalin moved to Florida in around 1919 and proceeded to single-handedly build a massive coral monument, which is now a tourist attraction known as Coral Castle (and which has a sundial within it). No one knows exactly how he managed quarrying, moving and sculpting over 1000 tons of coral by himself–when asked, Leedskalin gave vauge and cryptic answers. He wrote a few pamplets, some of which described his theories on magnetism, such as how electricity can be stored in a magnetic loop for months (here’s the “code” to some of these ideas).